However, CBCT scanning resolution is higher, with less artefact and scatter. The scan field of view can also be reduced to image smaller volumes and lower the radiation dose associated with each scan. 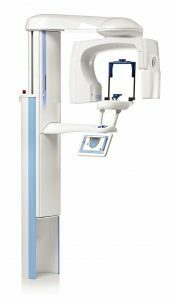 The Planmeca ProMax 3D X-ray unit complies with a multitude of diagnostic requirements: those of endodontics, periodontics, orthodontics, implantology, dental and maxillofacial surgery, and TMJ analysis. The images can be taken anywhere within the maxillofacial region. The 80 x 80 mm image size is optimum for most diagnostic applications that require whole dentition, mandible, and maxilla in the same study volume. The 80 x 50 mm volume can be used for single views of the mandible or maxilla. The small 40 x 50 mm volume is intended for molar area studies or for planning 3rd molar extractions. A 3D photograph (also called “surface scan”) provides a virtual rendering of, for example, the face and can be used to assess facial changes, such as asymmetry. It can also be used in conjunction with other examinations to restore or modify features for aesthetic or functional purposes. The 3D photograph is acquired using a sophisticated set-up of cameras and large white flashes. This is a completely radiation-free procedure. Though this technology is most commonly used to image faces, it can be applied to any other external soft tissue. The Planmeca ProFace module is integrated with our CBCT machine, in all its locations, uses high-definition cameras that give as much detail as possible about the contours and surfaces that are being imaged. The images are 3D digital files that can be processed by most software looking at plastic and aesthetic reconstruction. Our 3D photographs are carried out in conjuction with a 3D Scan. Planmeca Romexis is a comprehensive software solution for acquisition, viewing, and processing of 3D radiographs, 3D photos and intraoral surface scans. The powerful combination of these modalities provides the most accurate information of patient anatomy for different needs. Planmeca Romexis software offers specially designed tools for implantologists, endodontists, periodontists, maxillofacial surgeons and radiologists. The Romexis viewer software download link will be provided to you with the scan. Expect your patient to be with us for 30 minutes or so. They will be asked to remove any metal-containing jewellery or prostheses which may affect the imaging. Ideally, when planning for dental implant surgery, a stent should be provided. Please always ensure that the stent has been tried in the mouth prior to the scan appointment. You can refer your patients HERE.